Every semester, students are asked to update their personal information in the PeopleSoft Student Portal. Here’s a part of that process…so many options! 1) Is this another one of those annoying EphBlog parodies? Maybe! What do you think? 2) It is real! Would you have predicted this when EphBlog started in 2003. I would not have! 3) How do the answers that students provide affect official college reporting, as with the Common Data Set? My guess is that they have no effect. 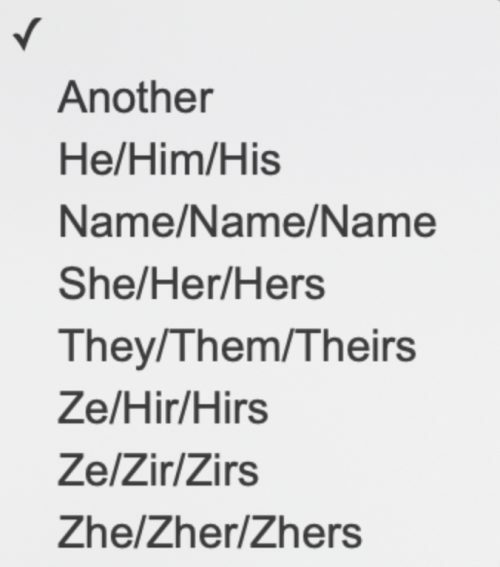 You can change your pronouns if you want, but Williams still records your gender as you selected it in the Common App. 3) What will Williams be asking its students in 2035? My guess would be that students will be allowed to change the official race and gender that the College records. What do you predict? In 2035 might the College as we know it be off the face of the map? If so, would it have deserved it? Why? Why is it ridiculous to refer to people as they would prefer to be referred to? EphBlog is powered by WordPress and delivered to you in 0.865 seconds using 38 queries..